Photograph courtesy Mark Cook. 25296 & 31233 run through Cheddington with an engineers train on June 2nd 1985. The Class 25/31 combination is a sign of the bleak times ahead as the Class 31s slowly replace the Class 25s from many workings. The working life of D7646/25296/25906 spanned nineteen years ten months, with a year spent at Sheffield area depots and the remainder allocated to a variety of London Midland depots. Built: Beyer Peacock, Manchester, No.8056. Angled strip at bottom of cab doors (at least one from No.1 cab later removed or fell off). April 1966 to Barrow Hill (41E). October 1969 to Liverpool Division (D08). June 1970 to Birmingham Division (D02). Renumbered to 25296 February 16th 1974. Renumbered to 25906 December 13th 1985. After withdrawal 25906 was stored at Basford Hall Yard until moved with 25199, 25244 & 25249 on June 2nd 1987 to Leicester Humberstone Road Yard and into Vic Berry's Yard the next day. By the middle of December 1987 25906 had been broken up. Noted Derby Works June 1969 (Intermediate). Noted Derby Works February & April 1972. Noted Crewe Works April & May 1974. Noted Derby Works January - April 1977. Noted Glasgow Works October 1979 (General repair). During its first summer D7646/25296 managed three round trips on the summer dated Sheffield - Llandudno Town service; on July 23rd, August 6th & August 27th. On June 17th 7646 & 5153 worked the 08.58 Derby - St. Pancras throughout. For the remainder of the 1970's 25296's passenger workings have gone unrecorded. On September 12th the 09.43 Liverpool - Glasgow arrived at Preston with failed 47480 being assisted by 25296 & 25319. On May 11th 25296 was noted arriving at Birkenhead North with two Class 502 coaches, the coaches would be processed here for shipment to Horwich Works. January was plagued by ASLEF strikes and poor weather, on January 4th the cold weather froze the stone in the Mountsorrell – Kennett working, led by 25277 & 25296, it was several days before unloading could take place. Photograph courtesy J Davenport. 25296 at Chesterfield on June 29th 1979. In a couple of months it'll be at Glasgow Works for its final general repair. The following year it would be part of the Rainhill exhibition. On February 27th the 10.00 Euston - Holyead with 85035 was piloted by 25296 between Coventry & Nuneaton. The Garston car train was noted at Hereford on March 5th behind 46039 & 25296. Photograph courtesy Tom Sutch. 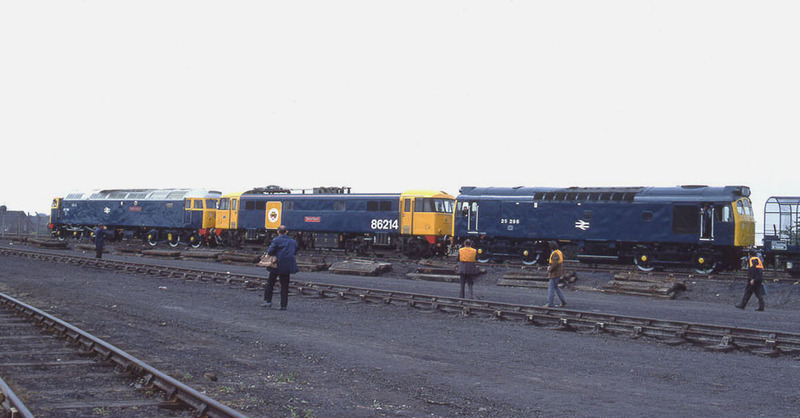 Three locomotives at Bold for the celebrations were 47581, 86214 & 25296 on May 25th 1980. 25296 was used to haul a number of freight vehicles past the viewing stands (see details below). Eurolease UK Limited Fauvet-Girel TCA (design code TC007B) 86 tonne Anhydrous Ammonia tank wagon number EURL78608. On June 17th a derailment at Lockerbie saw many WCML services diverted via the former GSW route. The 07.45 Euston - Glasgow arrived at Glasgow at 14.30 in charge of 47227, 25317 & 25296 were promptly attached for the return journey south. On July 29th 25296 worked the 09.40 Manchester Victoria - Llandudno Town. 31286 & 25296 were noted at Oxford on October 7th with a train of used rails originating from Newland permanent way depot. For 1981 25296 managed several visits to the Cambrian line. On July 25th 25296 & 25308 worked the 04.10 Shrewsbury - Aberystwyth returning with the 10.07 Aberystwyth - Euston to Wolverhampton. The next day (26th) the same pair worked the 08.45 Birmingham New Street - Aberystwyth (via Bescot) and returned with the 18.00 Aberystwyth - Euston to Nuneaton. Possibly the lengthiest passenger working took place on August 4th when 25296 & 25251 worked a roundtrip Maryport - Llandudno Town day excursion, a total of 468 miles. On August 29th 25296, with 25282 returned to the Cambrian line working the 10.10 Euston - Aberystwyth from Birmingham New Street, returning with the 18.00 Aberystwyth - Wolverhampton. On a wet October 29th 25296 was involved in a heavy shunting accident at Blackburn. Several wagons were derailed, a 12 ton van No. B762075 was heavily damaged, breaking a buffer on the No.1 end of 25296 and coming to rest against the cab front causing superficial damage. The locomotive was not derailed and was fortunate to have come away virtually unscathed. On June 26th 25296 & 25320 worked the 07.40 Euston - Aberystwyth forward from Wolverhampton, returning with the 14.00 Aberystwyth - Crewe. On February 7th & 8th 25296 worked the 22.47 Crewe - Blackpool North forward from Preston. On March 23rd whilst attaching extra vans 25296 failed at Hereford with the 15.02 Manchester - Bristol parcels, the station pilot 08668 removing the train from the mainline as no replacement was immediately available. 25296 was noted at Bescot on July 11th. It was back to the Cambrian line on July 23rd to work the 07.35 Euston - Aberystwyth forward from Wolverhampton with 25262 to Shrewsbury then with 25250 to Aberystwyth. 25296 & 25250 returned with the 14.00 Aberystwyth - Shrewsbury. 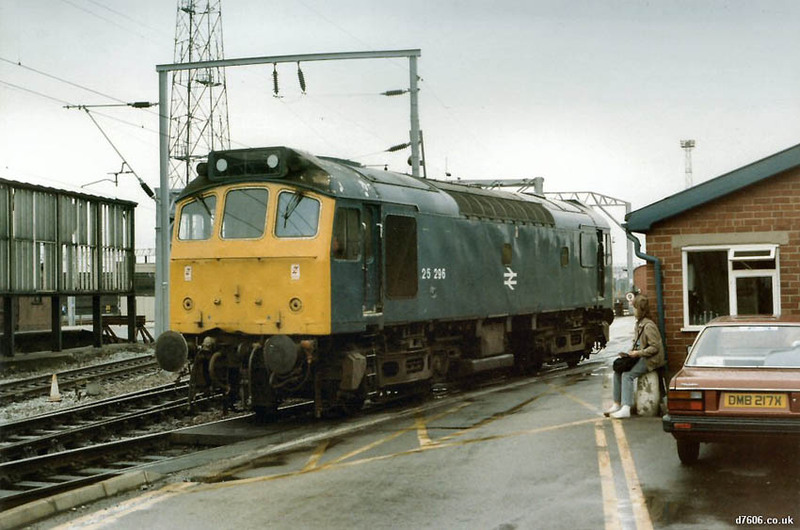 The last recorded working for 1983 took place on August 19th with the 14.26 Southport - Manchester Victoria. On the same day 25296 assisted the 11.15 Bangor - Scarborough after 46018 derailed at Salford, 25296 was noted at Manchester Victoria with the stock. 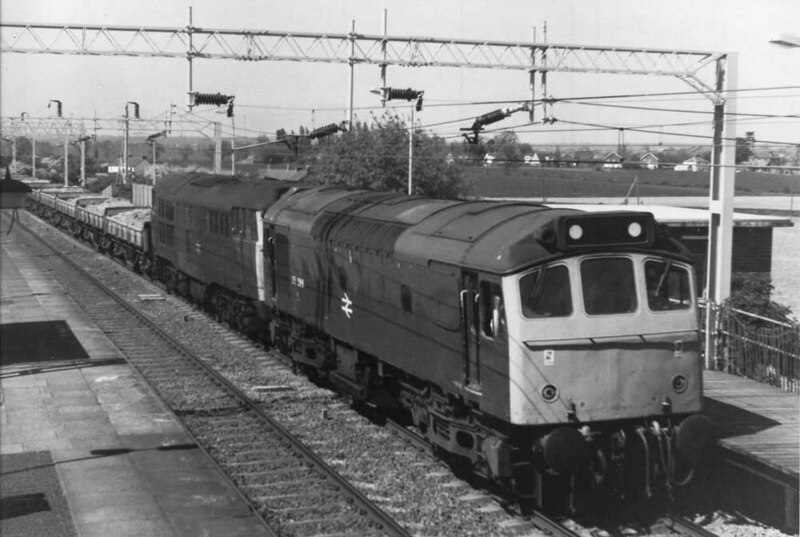 On November 6th 25296 & 25307 were noted on engineering trains along Woodvale aerodrome (Merseyside). On December 13th 25296 & 25268 were noted at Exeter with the tar tanks from Ellesmere Port. The passenger workings during 1984 started on February 27th when the 17.10 Bangor - York failed at Chester behind 45135, 25296 took over as far as Manchester Victoria. 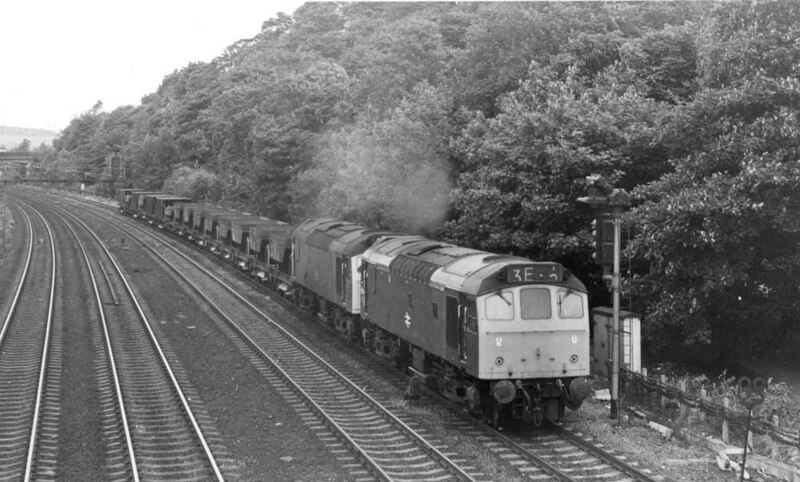 On July 14th 25296 & 25307 worked the 10.10 Euston - Aberystwyth from Wolverhampton (with fully air-conditioned stock for the first time to Aberyswyth?) and returned with the 17.05 Aberystwyth - Shrewsbury but got no further than Machynlleth where 25296 expired and was dragged to Shrewsbury. The next day (15th) 25296 went out on the 13.35 Crewe - Cardiff but failed at Hereford and was replaced by 47150. During the early hours of April 23rd 25296 arrived at Leeds PCD, it then ran light to Holbeck. On April 27th 47187, Hereford’s standby locomotive, rescued ailing 25296 near Abergavenny on the northbound UKF fertiliser. 1985 produced quite a variety of workings, starting on August 19th 1985 with 25296 & 25286 working the relief 10.41 Exeter St. Davids - Edinburgh forward from Carstairs. A month later on September 20th the 15.18 Llandudno Town - York failed at Chester behind 45103, 25296 worked the train to York. September 29th’s 15.00 Manchester – Swansea produced 25296 with eleven coaches, all was not well with the service as the train arrived over an hour late at Hereford where the standby locomotive, 47325 took over. Class 25s over the Central Wales line continued with October 5th’s 'Welsh Borderer' charter from Wolverhampton to Tenby hauled throughout by 25037 & 25059. As there was no way to refuel the locomotives at Tenby, the return trip was via Cardiff where 25296 & 25282 were waiting to take over for the return to Wolverhampton. Two weeks later on October 19th 25296 & 40122 worked the 15.08 Carlisle - Kings Cross from Carlisle to Leeds. Over the Christmas break the only Class 25s in South Wales were 25037, 25288 & 25906 stabled at Severn Tunnel Junction. 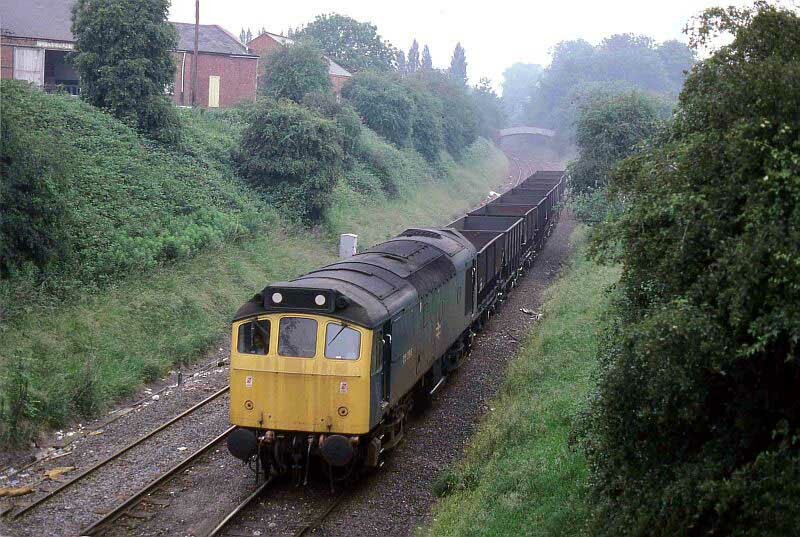 The latter machine had been noted on 17th on an Ellesmere Port – Severn Tunnel Junction freight. Photograph courtesy Ron Kosys. Its July 5th 1985 and the 6T46 Three Spires - Coventry goods is in charge of 25296 as it passes Daimler. This view is taken looking north from the Sandy Lane bridge. The station was situated behind the photographer, on the south side of the bridge. Photograph courtesy Ian Hammond. 25296 enters Crewe Depot on August 4th 1985, clearly the beginnings of another fine sunny summers day, somewhere. The minor damage to the cab front skirt may be from its shunting incident at Blackburn in 1981. 25906 remained at Severn Tunnel Junction on New Years Day, the only Class 25/9 not to spend the New Year in the Lancashire / Cheshire area. The final passenger working for 25296 was also in the north-west on February 7th 1986 working the 22.47 Crewe - Blackpool North forward from Preston. 25906 was withdrawn on November 1st 1986. Page added May 18th 2013.